I do Pixel Art, but I also do traditional art from time to time. Most of my pixels are characters from The Endless Forest community. But I'm going to draw TFH more. This is not perfect, grrr. I tried to draw with outlines, but I'm not really sure about this. Her name is Camila. She's a deer. I have no idea what I am going to do with her right now. The only think I came up with is that she can draw on her sketch book which she carries in a crossbody shoulder bag (might change that detail later). She also has a magical pencil that can draw depending on her will. For example, if she wants to draw with a regular (grey) pencil, it will become one. But if she wants to color her drawing with a specific color, it will become that particular color pencil. Everything drawn with that pencil will be (temporarily) brought to life. Which is why she also carries normal pencils with her for whenever she wants to do regular drawings instead of living ones. Oh, and she has really tiny antlers that look like really tiny horns. I might remove them in the future, unless I come up with a backstory for them, since does don't have antlers. Will probably change things over time. More TFH stuff coming soon, most likely fan-pixel art. I absolutely adore this idea. It reminds me of the very first OC I ever came up with back in my early days of discovering Lawyer Friendly Equines. I'm not sure why, but I've always been intrigued by the concept of casting spells by artistic means, and this seems perfect. I even kind of want to try and draw Camila. Just two questions: Can she also have a beret to look more artsy? Also, I see one leg has a darker shade of brown around it, why is that? Thank you! I kinda feel excited to see that someone wants to draw her. Although I like the idea of the beret itself, I don't really like the idea of her wearing a hat. I don't like hats in general for some reason, and I find it a bit cliché for an artist to wear a beret. As for the darker shade of brown. I actually got the idea from Velvet's Braxien color palette. I thought it would be nice to have the right leg colored with black or a dark brown shade and the hoof colored with her main body color. I think it's because it kinda looks like a mitten... and I love mittens! I also wanted her right leg to be different/unique from the other legs (which has nothing to do with the fact that I'm right-handed, by the way), but you are free to color her left leg the same way. Might actually be even better. Also, I prefer pointing it out, but please do not take that pixel art as an accurate reference. The proportions were not really right, sorry. EDIT: Just got the idea of her having a weasel as a companion. Don't know about his name though, I'm open for suggestions. That's okay, I understand where you're coming from. (I don't like wearing hats either, I always feel I look odd with a hat on ). Not only that, but I respect your vision for your OC, and I don't want to interfere with that. Before I may attempt to draw this, in comparison to Velvet, what sort of proportional differences would there be? Smaller? Taller? Floofier? When compared to Velvet, she's a little smaller. She does not have a lot of floof. The light part on the tail and the chest is floofy though, just not that much. She is thinnier/skinnier too. That's the only thing I have in mind. I'm not too sure however because it's always hard for me to visualize in my mind without a visual reference in front of me. You could just give it a try and we'll see? My . . . Camila sketch attempt? Sorry. But I'm sure you get what I mean. Other than that, she looks pretty good! Even better than the inital image of her I was able to visualize! EDIT: I just thought, about her look, the best picture that could describe it the most would be my profile picture. Honestly, I am both amazed and stressed. Amazed because I love what you did with the art. The colors are great and I really love your style! And the bag too. And stressed because... I was expecting you would use the same colors and patterns like on the pixel art I made of her (with both front legs darker and front hooves of the same main color). But the thing is, I do not want to be picky and to annoy you. I mean I should already thank you for changing the look in her eyes, and also for drawing her so... thank you! And, well, if you don't want to change the colors and patterns/markings for the ones I actually had in mind, I'm okay with the art as it is now as I still love it nonetheless. I don't mind expermenting though, I like the idea of the tip of her ears and muzzle being colored differently than her main color. That said, if you do accept to change them, I can give you the actual color palette. And make the pixel a bit bigger because I know they're kinda too small to let you see every detail. ^^"
Well, you shouldn't feel guilty about telling me how you feel. This is your character, not mine; and if what I've done isn't satisfactory to you, then that overrules me. So, please, give me a checklist of things I did wrong; and I will change them. Well, there's not much to change, frankly. Mainly just the colors. - You can experiment with the patterns/markings if you wish to, since I'm not sure about the current ones myself. 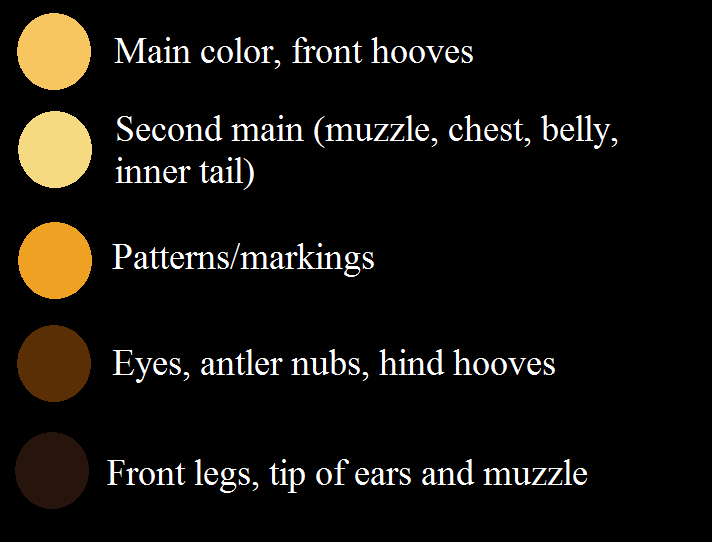 - I'm not really certain of the darker brown shade for the tip of ears and of the muzzle, you can use the lighter shade if you think it's better. - Oh, and the pink color for the inside of the ears is fine, no need to change that, unless you think it would be better with a different color. I always loved the Super Mario Strikers / TFH style! I find it so awesome and stylish! And the four colors on the left makes it even more awesome and stylish! I like her thinking pose, trying to figure out what to draw. And the idea of the magical pencil looking like an ordinary one too! As well as the sketchbook. Although I can imagine she drew a fake cover on the very first page with her name on it and everything, to make it distinct from the other sketchbooks. I did not know what color would be the bag. Green fits perfectly! Also, I think her ears are cute, lol. Now, as a thank you, I took the liberty to make you a gift. I hope it's okay. Have a little bouncing Knick Knack! I know I did not have to, but I REALLY wanted to! And I love him so much, I just could not resist making a pixel art of him. I hope you'll like it! Sadly, all the animations I had in mind were kind of too ambitious compared to my actual pixel animation skills, so I decided to just do a bouncing animation. Also, even though I really wanted to draw him as well, I'm not very good with roosters, unfortunately. I still need to practice more with different species. I've also got this for you. In case you would like to have a profile picture like the ones I've been making for myself, I've got one for you as well. (Just so you have the option to pick between what you want). This was fun! Have a wonderful day! Oh my, thank you so much! This is way better than my attempt to turn it into a profile pic myself, lol. I'm so glad and relieved you love my pixel, it was fun for me as well!